Noodle is one of the most famous food in the world. Actually, it is Chinese food. But now noodles have become a food that is almost everywhere in the world. For especially instant noodle, you can enjoy it anywhere by cooking it quite practically. Indonesia is the largest producer of instant noodles in the world. Some brands of instant noodles in Indonesia are a favorite of people abroad.To see more facts of Indonesian noodle, you can read these following paragraphs. Not only in Indonesia, Indomie has also become the most favorite noodle for people who live in several countries, such as the United States, Australia, Africa and European countries. In Africa and the Middle East, like Sudan and Lebanon, Indomie is always available in every retail and supermarket store. It is a great prestige, right? Sudono Salim is an Indonesian businessman who founded the Salim Group which oversees Indofood as a manufacturer of Indomie. The man born in China, 19 July 1916 is known as a person close to the second President of Indonesia, Soeharto. In 2004, this man was once crowned as the 25th richest man from Southeast Asia with a wealth of approximately USD 655 billion. The most surprising is in the United States, Indomie becomes one of the favorite Christmas gifts. In order to meet the demand in various parts of the world, Indofood does not only bring its products to various countries, instead of building factories in a number of other countries and contracting agreements with various companies there to produce Indomie. The two instant noodles taste of Indomie become one of the world’s best instant noodles. This was revealed by a man named Hans Lienesch. He is the one who has devoured more than 1,100 kinds of instant noodles from around the world and reviews them on a special blog. Two of Indomie’s flavors are Hans’ favorites, Indomie Special Fried Curly Noodles and Indomie Goreng with Roasted Chicken taste, BBQ Chiken Flavor. In his writings he mentioned that Indomie is the most delicious instant noodle he ever tried. Indonesia, which is rich in traditional cuisines from various provinces, inspires PT Indofood to make similar flavors from Indonesian taste. The most phenomenal is Indomie flavored rendang and iga penyet. Up to now Indomie has 62 different flavors. Indomie is increasingly famous after breaking the world record from Guinness World Records, as the largest instant noodle packaging in 2005. Then, Indomie managed to create Indomie package of 3.4m x 2.355m x 0.47m size and 664.938 kg weight. It has 8,000 times bigger than the standard weight of an instant noodle package. In addition, Indomie was awarded as instant fried noodles which achieved the largest sales volume of 14.1% of the total industry. Love to eat spicy food mixed with curry? Indonesia should be proud of this instant noodle product. Mie Sedaap Instant Kari offers instant noodle dish with spicy curry taste. Although the sauce is more oily than Indomie instant noodles, Sedaap Noodle is very rich in flavor. The taste of sweet spicy is so delicious, especially if added with fried eggs. The main ingredient of instant noodle maker is wheat which is not a commodity that can be planted in Indonesia. So, to be able to make instant noodle products, surely the producers bring in wheat from foreign countries, aka imports. The wheat was imported from various countries, it is from Ukraine and Paraguay. To produce a ton of wheat flour requires a seven million tons of wheat imports. 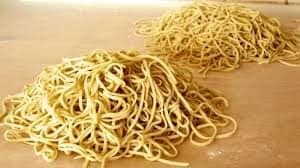 The biggest flour absorption was the noodle producer which reached 55 percent, while the producers of bread as much as 22 percent and biscuits 18 percent. Majority grain imports are from Australia, Canada, America, Russia, Ukraine, Kazakhstan, India, Pakistan, Brazil, and Argentina. Indomie’s popularity has indeed reached various parts of the world, one of them in Nigeria, Africa. Uniquely again, there Indomie really became a favorite menu, even to the point of being considered a staple food. In a week, thousands of Indomie boxes are always sold out. Approximately 40 million people from a total population of around 160 million are known to consume Indomie. There is even one Nigerian who is a millionaire just because of selling Indomie. A study of institutions that examine consumer behavior shows that Indomie is in the 8th position of 15,000 brands surveyed in 44 countries. It is even the main choice in 2 countries, namely Indonesia and Nigeria. The penetration of Indomie products in the global market is driven by a large market share in Malaysia, Turkey, Vietnam, Nigeria, and Middle Eastern countries. Indomie also has a halal certificate that makes consumers in Muslim countries interested. The brand of consumer products that occupy the top position in Brand Footprint is Coca Cola soft drinks. According to the Association of Bread Producers, Biscuits and Noodles, demand for instant noodles in Indonesia this year reached 16 billion packs. That is, with a population of 250 million people, on average every Indonesian person buys 64 packs of instant noodles per year. Not a small amount right? In conclusion, noodle is the favorite foods for all people, no matter what their nationality. Seeing that one of Indonesian instant noodle being very popular in over the world, won’t you be proud of that?